CHANTILLY, VA. — The CSA Show at Chantilly will take place for 3 days from Oct 9-11, 2015. Friday Admission is FREE, Saturday $8, Sunday $8 or Weekend Pass $15. Former MLB first baseman and ten-time All-Star, Steve Garvey, will be there to meet and greet fans and sign autographs on Sunday Oct. 11, 2015 from 9am-5pm at the Dulles Expo Center located at 4320 Chantilly Shopping Center. Source: CSA Shows. Steve Garvey is a former Major League Baseball first baseman and current Southern California businessman. He was nicknamed “Mr. Clean” because of the squeaky clean image he held throughout his career in baseballGarvey played for the Los Angeles Dodgers (1969–1982) and the San Diego Padres (1983–1987). He was the 1974 NL MVP, ten-time All-Star, and holds the National League record for consecutive games played (1,207). In the fall of 2012, Garvey underwent an operation to treat prostate cancer, and continues to raise awareness for diagnosis and treatment of the disease. 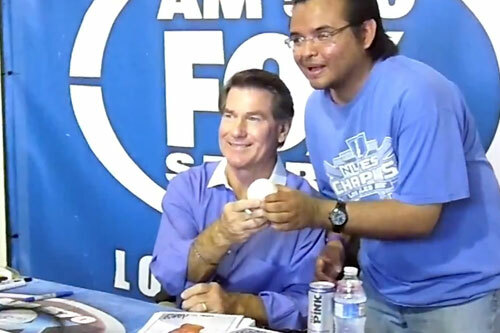 Today Steve Garvey is a popular motivational speaker and a sought after cancer speaker. Sports Speakers 360 is a booking agent for pro athletes. If you would like to book Steve Garvey for a speaking engagement, appearance or endorsement, contact Steve Garvey’s booking agent for fees at 1.855.303.5450.